This neat wall-mounted fold-out compact ironing centre is housed in a shaped surround and comes complete with a scorch resistant foam backed aluminised cover. Complete with steam iron (1200 watts) with black/grey casing. The head section holds the iron in a non-slip heat resistant cradle when not in use. The iron has a motion sensitive auto-off which cuts heat in 30 seconds if left unattended on soleplate and in 8 minutes on heel. The iron has a non stick soleplate. Indicator and cut out operating light. 145ml capacity water tank. Vertical steam 70g shot of steam and water spray. Complete with a generous 2m power cord and fitted plug. Supplied with simple wall-mounting fixings and cord tidy clips. Iron has black/grey casing. Dimensions: Ironing area: L600 x W270mm. Open: H940 x W360 x D740mm. Closed: H940 x W360 x D150mm. Available in White with foam backed aluminised cover or Black with foam backed aluminised cover. Also available with dry iron. Indicator and cut out operating light. Complete with a generous 2m power cord and fitted plug. Supplied with simple wall-mounting fixings and cord tidy clips. Iron has white casing. 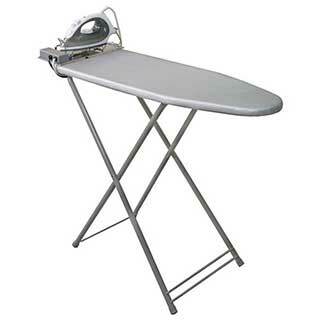 Dimensions: Ironing area: L600 x W270mm. Open: H940 x W360 x D740mm. Closed: H940 x W360 x D150mm. Available in White with foam backed aluminised cover or Black with foam backed aluminised cover. Also available with dry iron. Quality steel build for longer life. Anti-theft iron facility. Space saving design. Hook for wardrobe hanging. Cord tidy. Special feet for enhanced stability. Complete with Dry Hotel Safety Iron with Auto-Off timer safety feature - 30 seconds horizontal and 8 minutes vertical. Composite heat-resistant strap to retain iron. Metalised cover. Hotel ironing centre, free standing with steam iron. The luxury solution to in-room guest ironing. The Avantgarde Bedroom Steam Ironing Centre has a black stest look with a new improved siver coloured steam iron. 3 years manufacturers guarantee. Quality, steel build for long-life. Metalised cover. Space-saving design. Hook for wardrobe hanging. Cord tidy. Special feet for enhanced stability. Complete with Steam Hotel Safety Iron with Auto-Off timer safety feature - 30 seconds horizontal and 8 minutes vertical. Hotel ironing centre with steam iron. 15 minute auto-off timer. In-use indicator light. 2m power cord. UK or Euro plug, other plug types on request. Hard wired iron to prevent theft. Standard ironing area. Mesh board. 3 height positions. Cord tidy. Iron holder slides out to extend ironing area. Heat reflective cover, plus cotton over-cover. Option: Hook supplied. Easy fit replacement covers available. Dimensions: Ironing area: 94 x 35cms. Chrome iron stand slides out to extend ironing area to 100cms. Maximum size folded: 124 x 42 x 25cms. 3 year manufacturers guarantee. Hotel ironing centre with dry iron. 15 minute auto-off timer. In-use indicator light. 2 metre power cord. UK or Euro plug, other plug types on request. Hard wired iron to prevent theft. Standard ironing area. Mesh board. 3 height positions. Cord tidy. This lightweight compact modern ironing centre with steam iron has been designed specially for the hotel and hospitality industry. It has a durable powder coated grey finish and a metal mesh steam flow board surface. 1 height position, Anti-theft iron. Cord tidy and integrated hanging hook, Rubber tipped feet, Foam backed aluminised cover, White/Grey steam iron with Non stick soleplate, indicator and cut-out operating light. 1200 watts, CE Marked. 3 year guarantee. The steam iron has motion sensitive auto-off cuts heat in 30 seconds if left unattended on soleplate and in 8 minutes on heel. 145ml capacity water tank. Filling cup included. Vertical steam 70g shot of steam and water spray. Cord tidyand integrated hanging hook, Rubber tipped feet, Foam backed aluminised cover, White dry iron with Non stick soleplate, indicator and cut-out operating light. 1200 watts, CE Marked. 3 year guarantee. The dry iron has motion sensitive auto-off cuts heat in 30 seconds if left unattended on soleplate and in 8 minutes on heel. UK Plug 220-240V AC. This lightweight sleek modern ironing centre with steam iron has been designed specially for the hotel and hospitality industry. It has a durable powder coated finish and a metal mesh steam flow board surface. 7 height positions, Anti-theft iron. The steam iron has motion sensitive auto-off cuts heat in 30 seconds if left unattended on soleplate and in 8 minutes on heel. 145ml capacity water tank, Filling cup included, Vertical steam 70g shot of steam and water spray. UK Plug 220-240V AC. 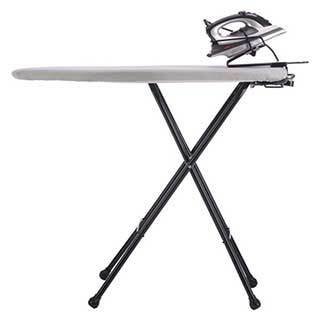 This lightweight sleek modern ironing centre with dry iron has been designed specially for the hotel and hospitality industry. It has a durable powder coated finish and a metal mesh steam flow board surface. 7 height positions, Anti-theft iron. 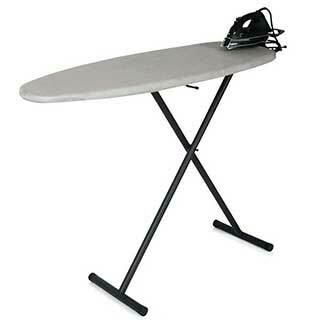 Hotel free standing ironing centre with dry safety iron. The favoured and neat solution to in-room guest ironing. 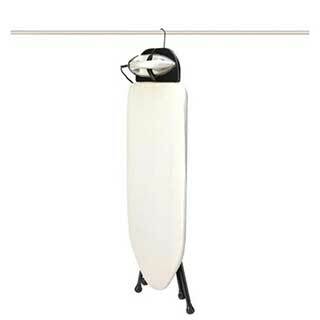 A lightweight floor standing ironing centre which can be easily stored in a wardrobe or cupboard, No assembly required. Complete with Dry Hotel Safety Iron with Auto-Off timer safety feature – 30 seconds horizontal and 8 minutes vertical. Composite heat resistant strap to restrain iron. Metalised cover. Adjustable board height. Space saving design. Quality steel build for long life. Anti-theft feature securing iron to board. Integral hook for wardrobe hanging. Cord tidy. Iron has black casing. 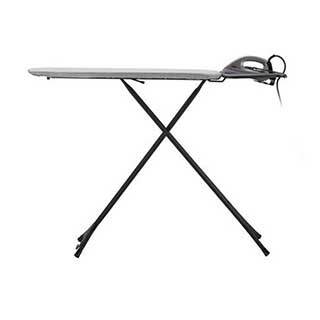 Dimensions: Ironing area: L600 x W270mm. Open: H940 x W360 x D740mm. Closed: H940 x W360 x D150mm. Available in White with foam backed aluminised cover or Black with foam backed aluminised cover. Also available with steam iron. Iron has white/grey casing. 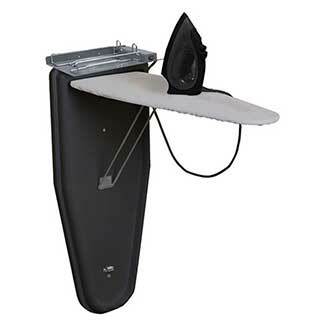 Dimensions: Ironing area: L600 x W270mm. Open: H940 x W360 x D740mm. Closed: H940 x W360 x D150mm. Available in White with foam backed aluminised cover or Black with foam backed aluminised cover Also available with dry iron. Iron has motion sensitive auto-off cuts heat in 30 seconds if left unattended on soleplate and in 8 minutes on heel. Non stick soleplate. Indicator and cut out operating light. Black Casing. UK Plug. 220-240V AC. CE marked. 3 Year Guarantee.